In January 2012 Rachel was taken by ambulance from our local A&E to the Freeman Hospital. Rachel was diagnosed with end stage heart failure. No one knew why. No one can imagine what it’s like to watch your child’s life slipping away. Every day her body was pumped with more and more medicines, she became thinner and thinner. But she never stopped smiling, she never gave in. She would play with the play specialist, the clown doctors and make bracelets. I wanted to scream and shout “this isn’t fair, why my child?”, but when I saw Rachel determined to keep going I decided to fight with her. Sadly Rachel’s body wasn’t responding to the medication and less than a month after diagnosis all that was left was to place Rachel on the organ donor register and hope that a heart would be come available in time. Rachel took this in her stride like she does with everything else. Rachel was becoming weaker and weaker and eight days after being listed, it was decided that Rachel’s body needed a rest and she was to be placed into a induced sleep (life support). When we told Rachel what was going to happen she just smiled, the smile that had kept us all going. I looked into my daughter’s blue eyes and wondered if I would ever see them again. The next time I saw Rachel she was in PICU and ventilated. I held her hand and read story after story to her. On 10th February I was sitting reading to Rachel when the call came that Rachel was going to receive her gift of a new heart. I couldn’t believe it. She had fought and fought so hard. Here was her gift, a new heart. A chance to continue to live her life. I saw Rachel the next day, she was covered in wires but she was awake and I could see those blue eyes. Rachel made excellent progress and within three to four days she was out of PICU and back on the ward. She continued to get stronger and stronger and was home after three weeks. Life was not to be the same for Rachel, life has changed but Rachel embraced these changes. Rachel lives with a life limiting condition. A life that at anytime could be taken away due to infection or rejection. Rachel will take immunosuppressants for the rest of her life. But this doesn’t stop or hold her back. Rachel’s health has been a constant battle. 2013 – Raynaud’s Phenomenon, a condition that restricts the blood flow to the hands and feet making them cold and white and painful. 2013 – Hypermobility syndrome with bilateral flat foot, causing constant pains to her knees legs and feet. When the pain is unbearable she uses a wheelchair. 2013 – Low immunity to infection requiring a weekly subcut infusion of a blood product immunoglobulin into her legs. 2014 – Stomach and head migraines lasting days to weeks. 2016 – 14 weeks of diarrhoea causing weight loss and fatigue. 2016 – Blocked femoral artery causing pain to her leg and three months of daily injections. 2017 – Followed by a diagnosis of Chronic Fatigue Syndrome – ME. On top of this Rachel has to attend eight-weekly transplant clinic, blood, ECG, echo etc. Appointments with all the different consultants she sees. Tests after tests. Numerous hospital admissions and appointments. 2019 has been a busy year so far for Rachel. It started with a three day admission to check Rachel’s heart and stents under GA in the cath lab. Rachel’s heart is looking fabulous, but her stents needed to be ballooned back up. Lots of test carried out. Transplant clinic continues to be every 8 weeks. Rachel’s has had a MRI on her legs for her Muscular Dystrophy and a MRI on her head due to blurred vision, headaches and sight issues. No results back yet, but all very stressful for Rachel. Lots of hospital appointments, MDT meeting and involvement from CNDS team. Life is driven at the moment by Rachel’s chronic widespread pains, Muscular Dystrophy, ME and generally feeling yuk. This is all causing massive sleep issues. We are very proud of Rachel as she has managed 30 minutes of home tutoring so far this year. On the 10th February we celebrate Rachel’s 7th heart transplant day which is always very emotional. Happy that Rachel has made it this far and we are able to celebrate another milestone, but sad that another family has another year without their loved one. We also celebrate Rachel’s 15th birthday. We can’t thank everyone enough for all the cards that Rachel received for her birthday. When your child doesn’t attend school they don’t tend to get many, so you all made her birthday very special. Thank you to everyone that has sent post to Rachel. Sorry that I am unable to thank you all personally but you’re all amazing. Rachel’s health is still plagued by chronic diffused Pain. The Chronic Fatigue Syndrome has not been good and Rachel has been bed bound for days and days. Sleeping and resting more as she tries to take her mind off the pain. Rachel is struggling to handle all of her complex medical needs and as a family we are trying to deal with this together. Due to the weather change and added stress and anxiety Rachel is enduring at the moment her Raynaud’s Phenomenon is flaring up more and more. The results from the endoscopy showed that Rachel has Centrally Mediated Abdominal Pain Syndrome, which means she is now living with a constant chronic pain to her abdomen. Rachel is seeing the Pain Team about this. Rachel has lots of hospital appointments over the next two months up to Christmas. Hopefully some answers to why her face and stomach swells up everyday, a plan to help with the constant pains and an opportunity to catch up with the Muscular Dystrophy and transplant team. All the consultants and specialist involved in her care are trying to support her the best they can and give her the best possible future. On a positive note Rachel has had an assessment for a Power chair which hopefully will help give her a little independence and help ease the pains to her legs and feet. I would like to say the biggest thank you for all the post Rachel has received since her last update. She’s been overwhelmed by it all and you’ve made her so happy, she’s loves opening it all. We read all the cards and letter together. Thank you to everyone that sends post to Pals and spreads so much happiness around. We have now hit the two year mark since Rachel last attended school and there’s no sign of her returning due to her many complex needs. Rachel is very low at the moment as her sister had left to go to uni and everyone is talking about going back to school. Too many hospital appointments to keep up with and more medication changes and more medication to be added. Life is tough and at Rachel’s age she is more and more aware of how her body is letting her down and that there are many things she can’t do any more due to her LGMD1B. Living with a constant abdominal pain and joint and muscle pains is very tiring and causing her to feel fatigued even more. Rachel rests a lot during the day and uses her wheelchairs whenever we are out. She has two admissions due this month, at least 5 teeth out, and an endoscopy. On a positive note, we are due to start renovating the garage into a downstairs bedroom and wet room for Rachel to give her more independence. This will hopefully help her feel more part of the family. As she can’t manage stairs very well and at the moment is isolated upstairs. Rachel has loved all the post she has received and it’s the one part of her life that has remained normal and FUN. The gifts and cards she has received have been personal and very touching. Thank you everyone. I don’t get on Facebook very often to say thank you but we really appreciate everything you all do. Life isn’t the best for Rachel, with her complex medical needs giving her ongoing health issues. At the moment she has to endure 1-3 hospital appointments most weeks, weekly physio and weekly subcut infusion. She’s also waiting for three admissions for procedures to be carried out. Rachel had her first appointment with the Genetics team after being diagnosed with a rare progressive muscular and skeleton disease – Muscular Dystrophy LGMD1B. This appointments was extremely stressful for Rachel and a eye opener for us all. Rachel’s lung function is only 50-60% and this would explain why she gets breathless and tired. Her wrists and fingers have developed contractors and she needs supports to help ease the pain. Rachel has pains in most of her joints, but the pain is worse in her ankles, knees, shoulders, back and wrists. The muscles are weakening in her arms and legs. Rachel has been referred for hydrotherapy to help ease the pains and relax her muscles, and pain management to help control the pain she is in. As this is a rare genetic mutation, no one can say yet how progressive it will be. They can only monitor Rachel and support her. Rachel is struggling to come to terms with the diagnosis of LGMD1B. She finds it hard to see a positive future when so many things she use to be able to do she can’t any more and she’s aware that the diagnosis is progressive. Rachel’s chronic abdominal pain is causing her lots of distress and this really doesn’t help her Chronic Fatigue Syndrome and she can be bed bound for days. She’s due to have an endoscopy very soon so they can make a diagnosis. Rachel can have days and days when she can’t sleep due to the pain. It’s hard as the pain in her stomach never goes away. Cardio transplant clinic continues to be every 8 weeks and Rachel is due there next month. Lots of tests to be carried out. Alongside this, she continue to see the respiratory and immunology team. Chronic Fatigue – ME – continues to be a struggle. Rachel feels tired and fatigued but is unable to sleep due to the pain. Constantly feeling tired. Rachel’s having weekly physio which, sadly, is a reminder to her of what she can’t physically do any more. But hopefully it will help in the long run. It’s been two years since Rachel last attended school and at the moment there’s no plans for her to be able to return. This causes isolation and can make Rachel feel very lonely. This time of year is especially hard on her as everyone is getting a school report, going on school trips and having leavers parties. Through all the hospital appointments and ongoing health issues, with the support of Post Pals we try hard to make life as happy and fun as possible. We managed to attend the Post Pal trip to Chessington, which was truly amazing and we made many, many happy memories. Thank you for the ongoing support Post Pals has given to Rachel. The happiness the post gives Rachel is priceless. We really appreciate you all and can’t thank you enough. I’ve struggled with this update as it makes it all seem even more real. I am such a positive person but life is rubbish at the moment as we are all trying to get our head around Rachel’s rare genetic diagnosis and what this means for Rachel. A recent appointment with the Genetics Professor left us with even more questions and a very upset Rachel. Lots of leaflets on Muscular Dystrophy and more appointments. Trying to remain positive. She is still living with the chronic abdominal pain. Rachel has recently been diagnosed with a Rare Genetic Muscle disease: Lamin A.C gene – Laminopathy De Novo Lamin Mutation LMNA c.868G>A (p.GLU390Lys) Skeletal muscle disease. Muscle weakness and contractures. There’s no cure for this condition. Rachel will need to have long term physio and hydrotherapy to help reduce the muscle and joint pains. We are waiting to see how this will effect Rachel short term and long term. This would explain why Rachel can’t do certain physical tasks she used to and how her wrists and fingers have formed and can’t be moved as much. She struggles to write. She’s been having terrible trouble with her wrists, legs and back. Genetics want to keep a close eye on her breathing as this is also one of the problems related to this genetic mutation. Rachel’s had the OT out and they are applying for a stair lift and to change our main bathroom to make life better for Rachel. Rachel’s also having a terrible time with stomach pains which aren’t relived with any pain relief. She’s endured a few trips to A&E and 5 days admission into hospital. No answers yet, had CT scan of her stomach and lots of bloods taken. This is all getting Rachel down. We are desperately waiting for a plan and a way forward. Rachel’s been referred to pain management. ME – Chronic Fatigue continues to be a struggle, with Rachel feeling tired and fatigued but unable to sleep due to the pain. She’s spending all her time lying around in her bed staring at cartoons and constantly feeling tired. Rachel had an overnight admission to hospital for her Cardio transplant. Rachel is waiting for CT of heart and blood results. Rachel continues to attend transplant clinic every 8 weeks to make sure her heart is ok.
Rachel’s list of consultants and medical conditions is getting longer: Vascular, rheumatology, Cardio, neurology, Dental, Gastro, physio, hydrotherapy and Genetics to name a few. At the moment it’s all getting too much for Rachel – she’s feeling that she’s never going to get back to school and be pain free. She’s struggling, as she has that many consultants and specialist involved in her care that at times it can be overwhelming and hard to manage especially as she’s autistic. Thank you to everyone that supports Post Pals and sends Happy Post. The post Rachel receives gives her an opportunity to forget about her complex medical needs and feel very special. Rachel loves opening the post and gets me to read them to her (Rachel’s concentration isn’t the best). Thank you from the bottom of my heart, for all the smiles you have given to Rachel. 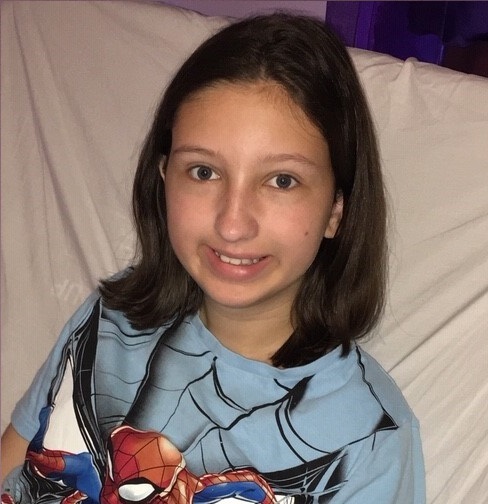 Rachel now hasn’t been to school for over 16 months due to complex medical needs and she can feel very isolated as she has little contact outside the house. Please keep spreading the smiles around, you guys do an amazing job. Rachel’s health continues to be an issue with a number of hospital admissions arranged. At the moment the biggest problem is gastro with Rachel having a constant distended stomach and pains which are causing her to have no sleep and feel generally rotten. More changes to medication and more medication added to try and resolve this ongoing problem. Rachel’s chronic fatigue (ME) is causing lots of pains in her joints and leaving her feeling very isolated and lonely as she hasn’t attended school for 14 months now. Rachel spends most of her time in bed watching DVDs. This gets her down a lot. Rachel’s had a few bad stomach and head migraines recently so her neurologist is looking at her medication to see if anything needs changed. Rachel’s heart transplant means she attends clinic every six to eight weeks. Rachel’s yearly admission is due next month. We are waiting for further cardio genetics tests to be done and a referral to a muscular genetics consultant. Rachel has lots of hospital appointments due and her dad thinks we should get a PA to make sure we don’t miss any (lol). Having so many different medical conditions can be very hard on Rachel, at times as she feels like she never gets a break from it all. Even her consultants refer to her as the complex needs child. We all really appreciate everything Post Pals does. It’s hard seeing your child go through so much and not be able to make a difference but seeing Rachel so happy receiving post is wonderful to see. Rachel is still off school and has been since last year, emotional upset and her concentration is very poor. She’s due to start FOBMAP diet due to her Gastro issues so she can’t have any chocolate and most sweets. (No wheat, dairy, gluten and loads of other things), Rachel is very distressed about this as she loves chocolate. Rachel’s been getting more pains in her feet, legs and knees. Her consultant feels it’s due to Rachel not being active due to her ME-CFS and she now has daily physio to do in bed. Hopefully she’s going to get a new wheelchair this week. Rachel’s been struggling with her weekly subcut infusion (realisation that it’s for life) and the pain it causes hopefully this will settle down otherwise it’s back to having it done in Hospital. Rachel still attends cardio transplant clinic every 6-8 weeks for all the regular tests. Rachel and I would like to say a BIG thank you for all the welcome cards and goodies that have been sent. You have all put a BIG smile on Rachel’s face. I’ve not seen her this happy in a long time. Sorry that Rachel’s not up to writing replies but she loves me reading them all to her and helps me reply on Facebook. Rachel continues to struggle with her ME and she has days when she physically can’t get out of bed and relies on her daily painkillers to enable her to move. Rachel is seeing more and more specialists to help with her ME, Hyper Mobility Syndrome and joint pains. 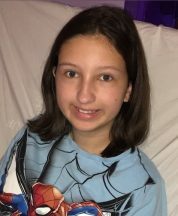 Rachels is also having more Genetics tests done due to her heart transplant and finding a problem with one of her genetic genes. Gastro issues continue with daily bloating of the stomach and more referrals and tests to find out why. Loads and loads of hospital appointments.